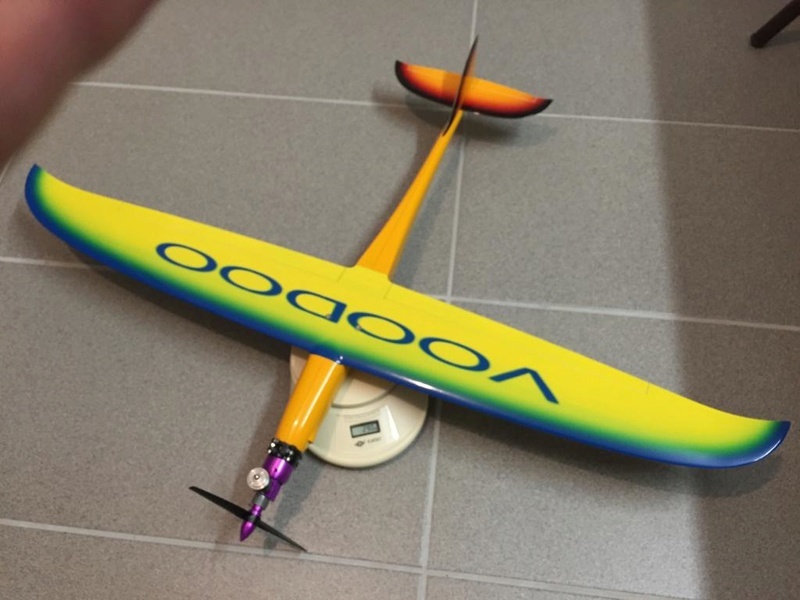 Having looked at the Speedy projects of Brad (1/2A Nut) with yearning eyes and recognizing that with my limited infrastructure and skills I would never be able to build my own customized speedy model, I took the simpler solution and ordered a beautiful RTF electric model called VooDoo, with the aim of converting it to glow. The VooDoo is a 1st class, glass reinforced plastic product sold in Europe (designed and produced in Slovakia) , and originally an electric model with speeds up to 250km/h with 250 Watts electric motors (a bunch of youtube vids boast on that), I thought a TeeDee049 of 80W shaft power will also be able to carry it, if not at 250km/h but at least at decent speeds above 100km/h. The firewall then was drilled to accommodate not only the TD049 R/C engine mount, but a horseshoe backplate Black Lynx I just won on CEF…I would like to employ most of my 049/050/051 COX engines of enough power in this plane..
For the TeeDee I also had to relocate one of the engine mount holes from 10 o’clock to 11 so as to allow entry for the throttle pushrod through to original hole at 10 O’clock. 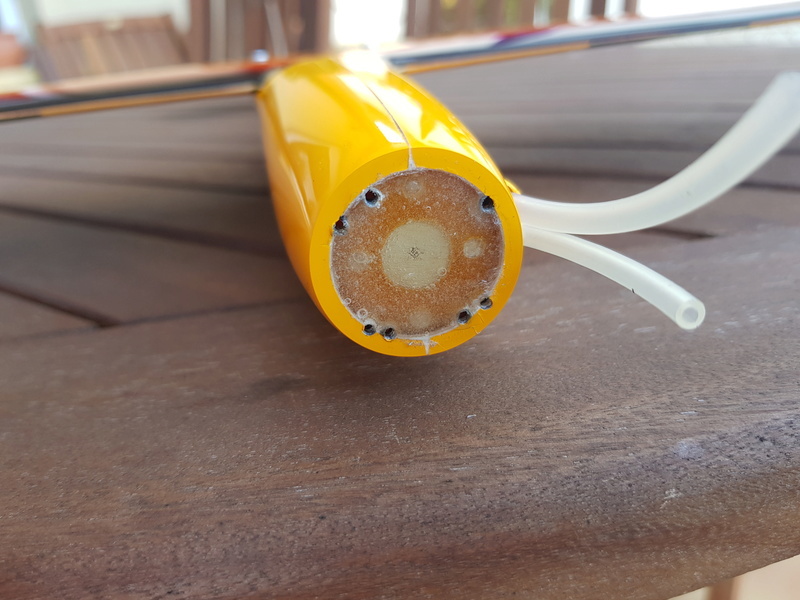 I still have to install a throttle servo, the battery and receiver that I will probably place on delcro tapes glued to the fuse bottom, as well as a switch (I will hate to drill holes into that beautiful fuselage), but all in all I expect the TeeDeeVooDoo to weigh around 320 grams empty (here 327 grams because of packing material on the switch and the servo) or 350 grams when my traditional ballon tank is filled with about 1 ounce of fuel. 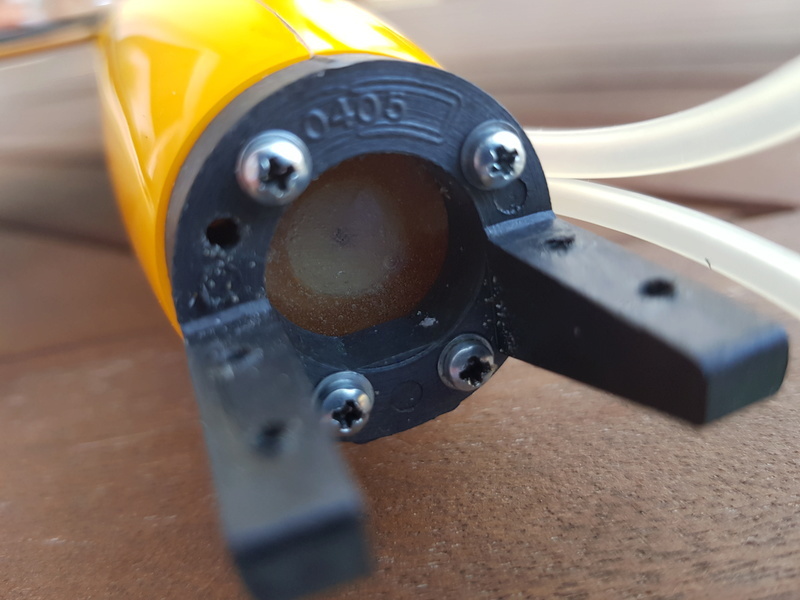 Note that the vent opening made on the left front of the fuse for cooling the electric motor comes in handy for exiting the fuel and filling lines from the ballon tank inside.. I like friend that adaptation of the model to glow, in addition the model is seen with very clean lines and surely it will be an arrow in the air. Very good work András, I hope to see the model soon in action. Do you have the link or more data of this model ?, I have a good option to keep in mind in a future project. What a nice line of models, here I leave a link from the USA, maybe it can be useful also to another enthusiast! Your model is very beautiful András, with the Cox it will be a wonder! Thanks for the greenie Mauricio !!! 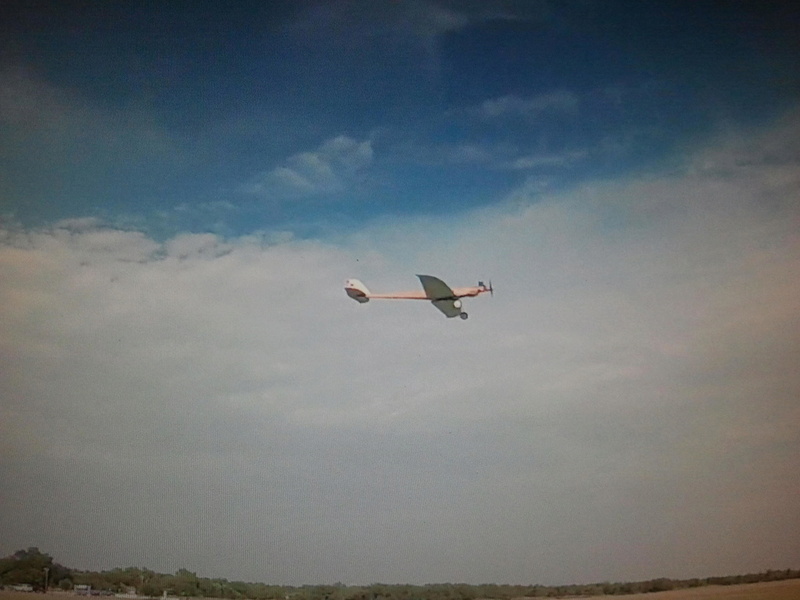 Beautiful airplane , Just watched a fling video what i could see of it , man that thing's fast !! Bee watching for the Maiden . 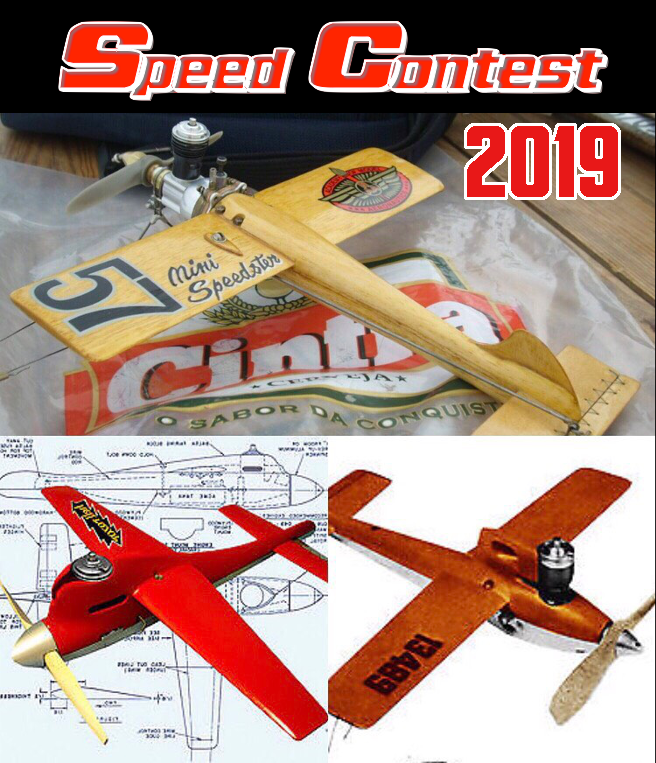 I do not expect such high speeds with the TD049 as with the electric motor, but assume it will fly as fast as Brad's (1/2A Nut) similar speedy planes powered by TD-s. Somewhere in the 100-120 km/h range. I guess I can still handle that. My problem is the accessibility of the flying field that I cannot enter by car anymore, and weather is not good enough yet to ride there with my motorbike. Hello András, great effort to get a fast plane in the air. 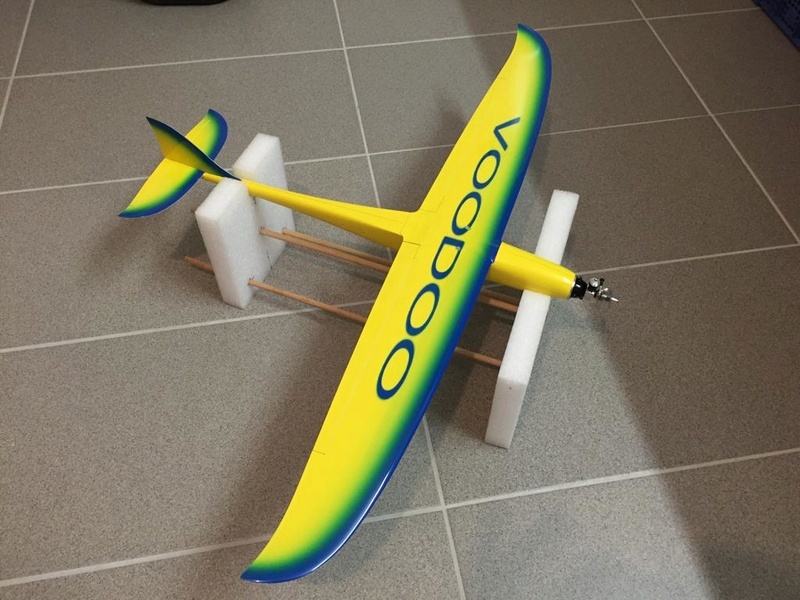 - TDVooDoo weighs 11.53 oz perhaps a APC 4.5x4 will pull the weight and wing size ok.
With the very restrictive muffler type perhaps a APC 4.2x4 will give you a bit more speed. 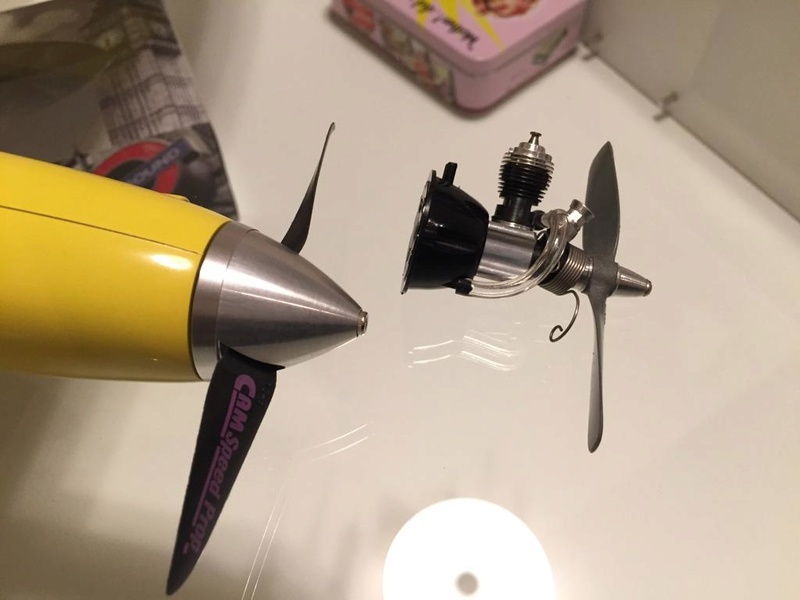 What size prop do you have on it now looks like a ridged 5x4? Wing span is 33 inches 109 sq. in. 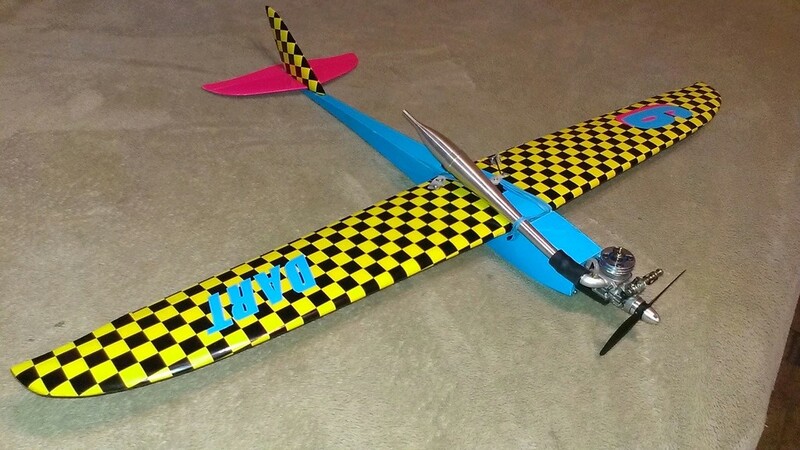 - Lil Speedy weight is 6.2oz and flew 190 km/h. with a 4.1x4.1N prop. Wing span is 16.75 inches / 66 sq. in. 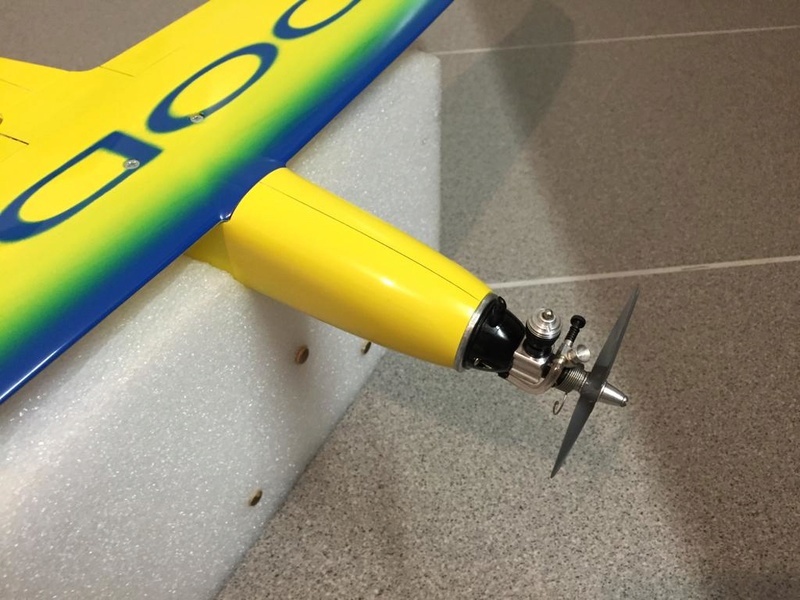 - NANO III is 9oz and flew 224 km/h with a 4x5N prop. 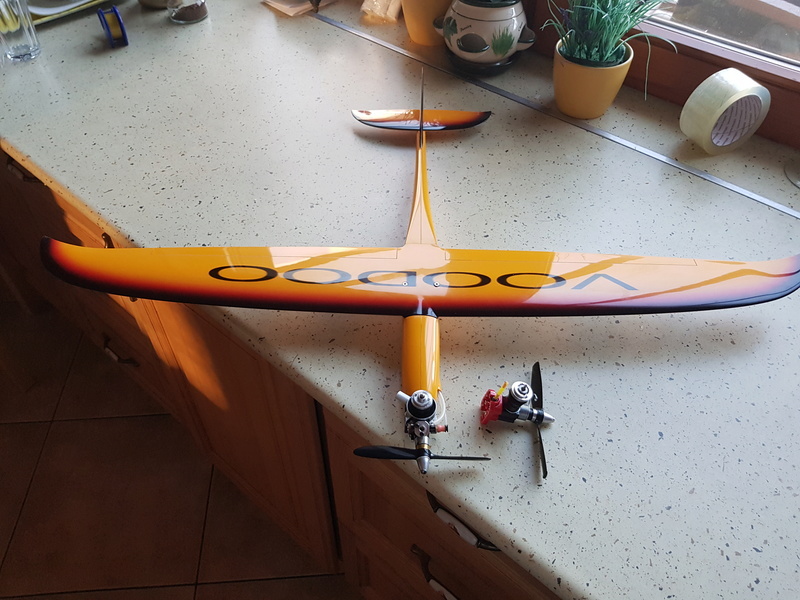 Best wishes on the maiden flight when the weather gets better! 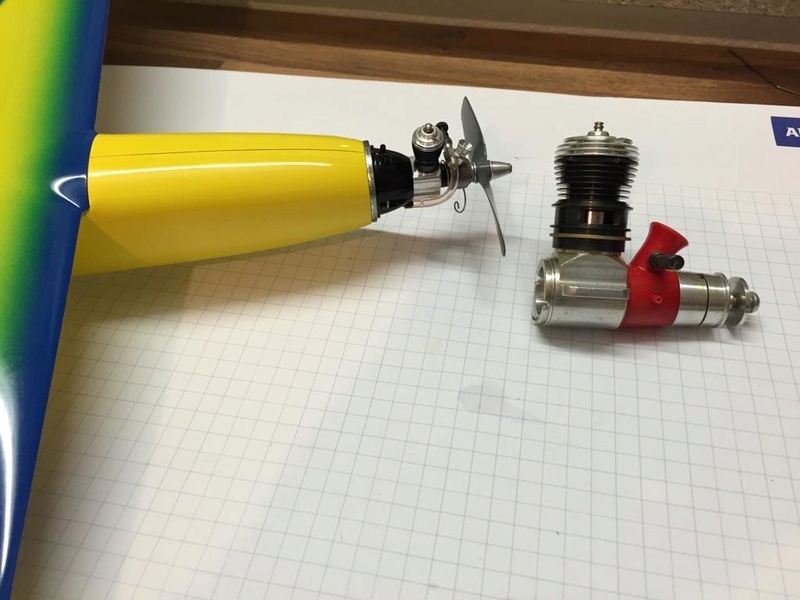 Did you add some right thrust for prop torque? I appreciate your input. I did not add any thrust as I thought the design of the airplane already considers that off-setting for the electric motor. The muffler I put on the TD is just to deflect the castor splashing from the engine and I understand may cost me 500-1000rpm. BTW I was relieved to test and find the paintwork of the plane is nitro-proof. If the scale in the picture is right, I think it's going to be a quick little bird. That would be 11-12 oz. in my part of the world. My oldest Baby Flite Streak isn't much lighter, and a Tee Dee .051 hauls it with authority. Be ready to experiment with different props so you get the most out of it. I really like that design, it looks fast just sitting on the table. RknRusty wrote: If the scale in the picture is right, I think it's going to be a quick little bird. 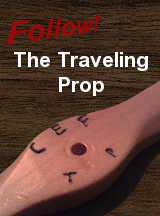 Be ready to experiment with different props so you get the most out of it. I really like that design, it looks fast just sitting on the table. I like the design too. Looks almost like a copy of Brads Lil Speedy with the shape of the wings and tail feathers. 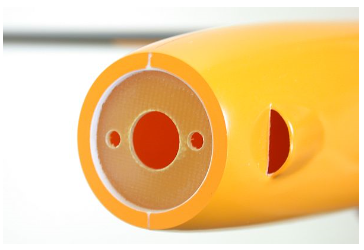 Round Rolled tube fuse to. CopyCats! 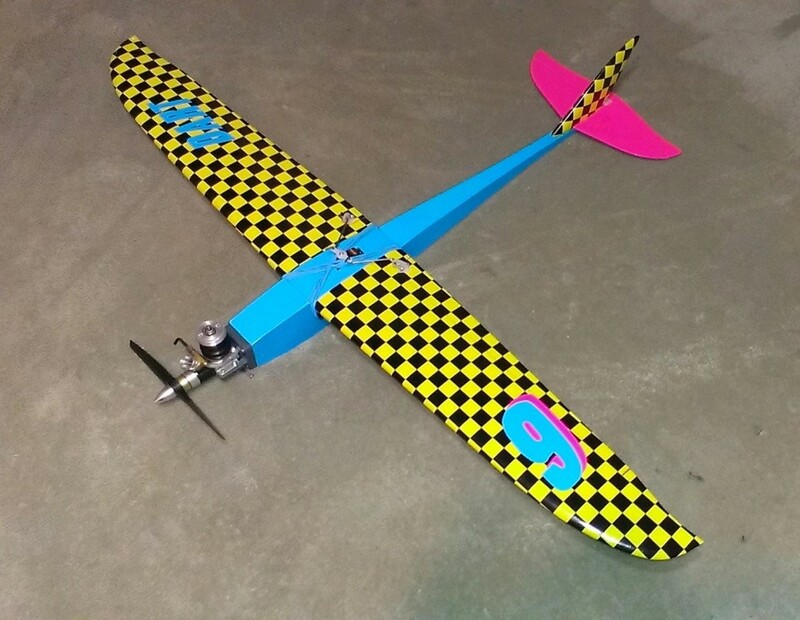 Sorta like the DART in size 31" wing span 106 sq. in. It has hit 148 mph / 238 km/h with a .05 car engine tuned pipe. Nice project. I did this a few years ago. Thanks. 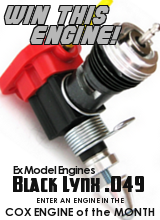 What was your experience with the small 010 and the larger 049 engines? Are they powerful enough especially the 010 to drive the VooDoo? It will barely climb with a TD .010 based on what I have done with that displacement. 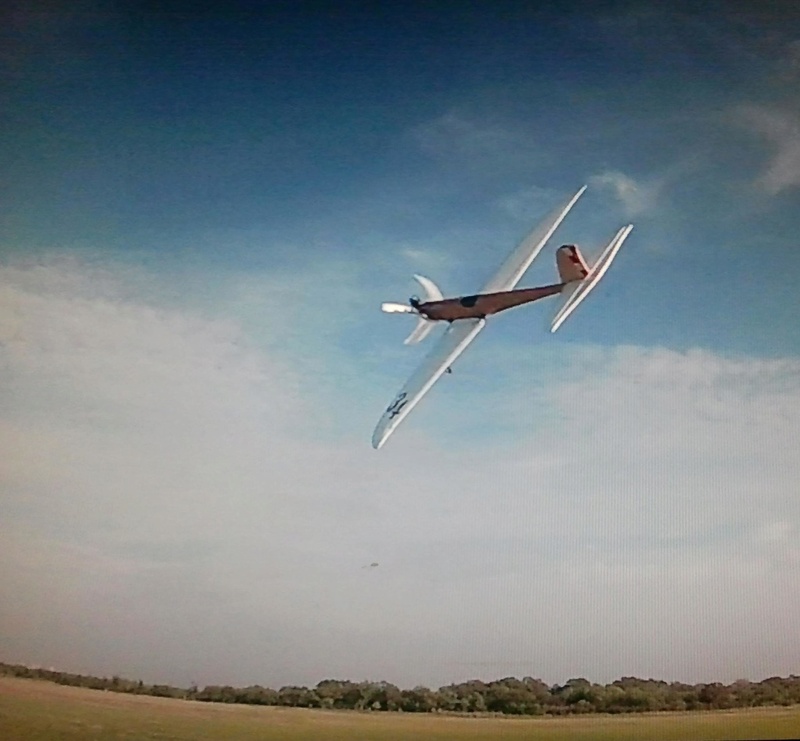 be a slow crawl to glider height into the wind. power to weight would be a bit boring with a stock prop 5.4oz thrust with a good running engine. 2P will not do much for speed but can dive down wind to bring it up to 55 mph ish. is what going to move this plane out with authority. Could then use a spinner in it's proper place. A car engine on a tuned pipe like what was done with the DART would for sure hit 135 ish. Unsure without owning one with whats possible with a engine cutout. I anticipate the TD .049 open exhaust perhaps 90 - 110mph with the right prop selection. HQ Carbon mix 5x4.5 cut down and narrow to 4.5x4.5 would be my prop of choice for the first flight. Would yield steady screaming rpm / great fuel draw and thrust for a good solid climb out. 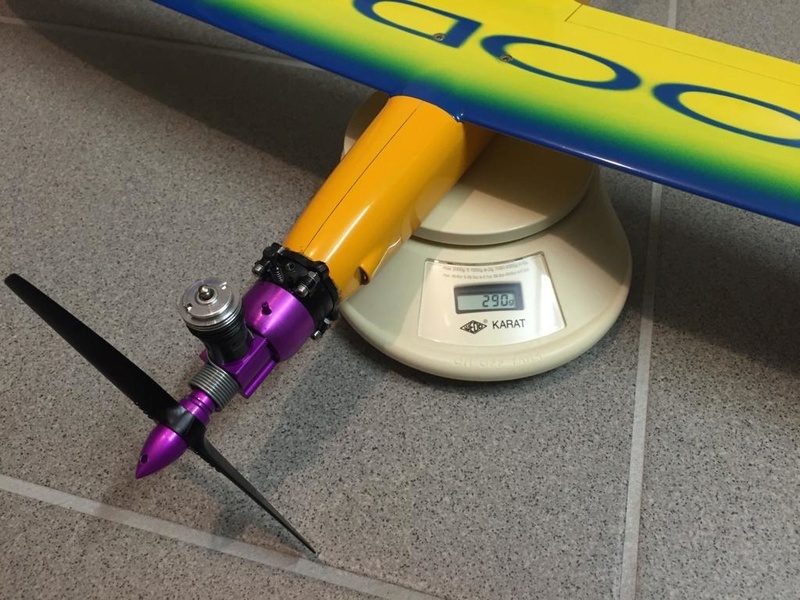 Your Cox 5x4 will make for a good maiden prop watch out for the prop torque though. Cox High Comp Plug /aluminum carb body / pressure tap on muffler. Tee Dee RC .050 - All Carbon 4x4.5 speed prop. 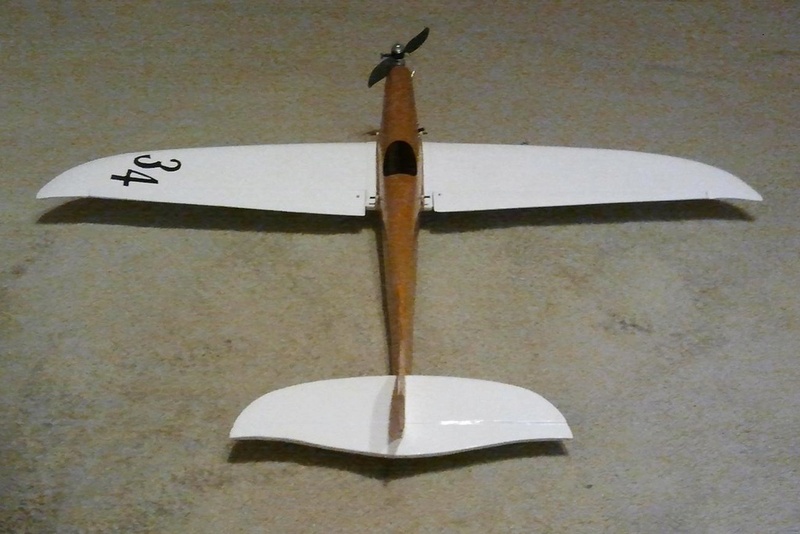 Flown with a 4x5 carbon / nylon 139 mph. NANO III. Thanks, Brad, very good analysis. When I first saw the VooDoo here on CEF one of our members introduced it as converted for a 010...I had some doubts then on the power of an 010 being enough so I postponed my further steps into this project. 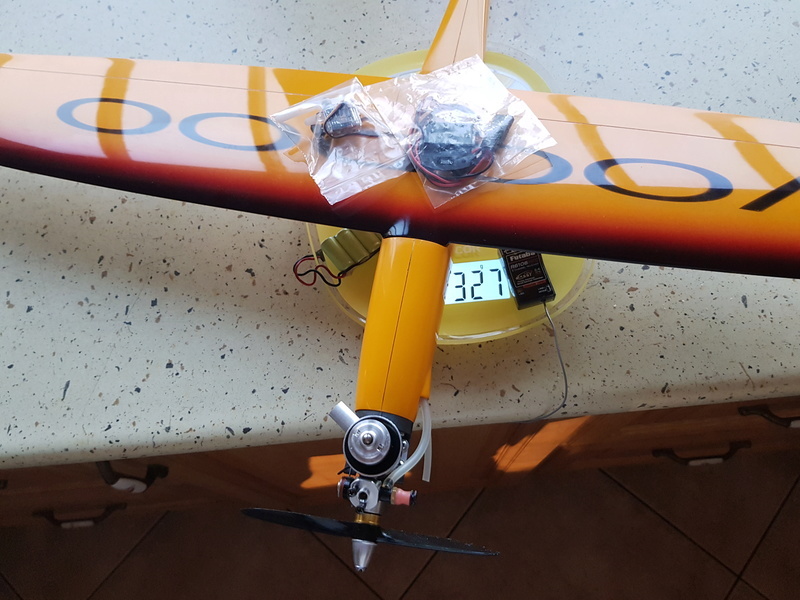 Now that I have seen your Nano III with similar size and proportions flying so well I decided to invest into the VooDoo. 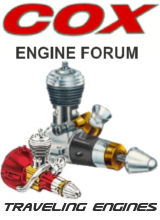 The cutout of engine compartment to match the engine mount dimensions of a COX 09 or NV would practically reduce the fuel compartment to much less than 1 oz so I will stay with the 049 TeeDee whose engine mount is just the same diameter as the nose of the VooDoo. I trust it will achieve your estimated 90-110 mph or a bit less due the the muffler I added to the SPI engine. 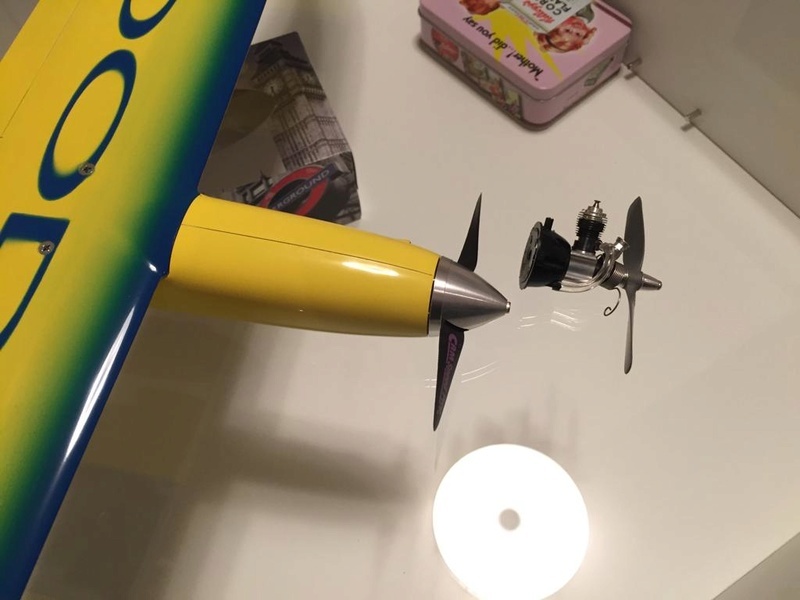 The prop torque is an interesting issue. I assume this has been factored in in the geometry of the original design for electric motor, and I did not notice any offset angle on the recessed firewall for that, and the resin fill I added now makes the glow engine mount surface parallel with the original firewall of the electric motor. So if offsetting is needed it remains there with the resin fill, if not needed, it is also OK.
Once I read somewhere that the offsetting is needed not so much because of the prop torque (or rather, gyroscopic torque), but because the spinning air the CCW rotating prop blasts on the tail section of the fuselage and the stabilizer wants to turn the plane to the left - hence the firewall needing some offsetting angle to the right... 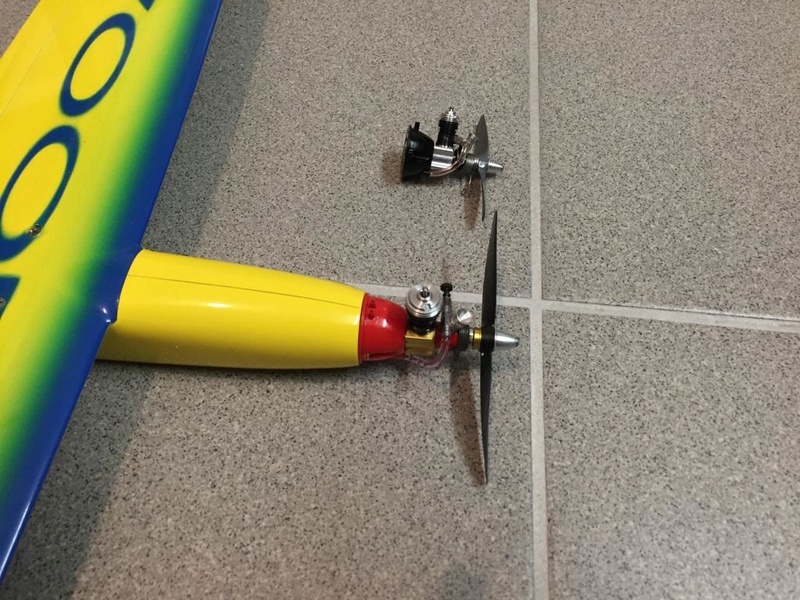 This VooDoo has such a slender fuselage and small stabilizer surface that I think such moment from the air blast can be neglected? 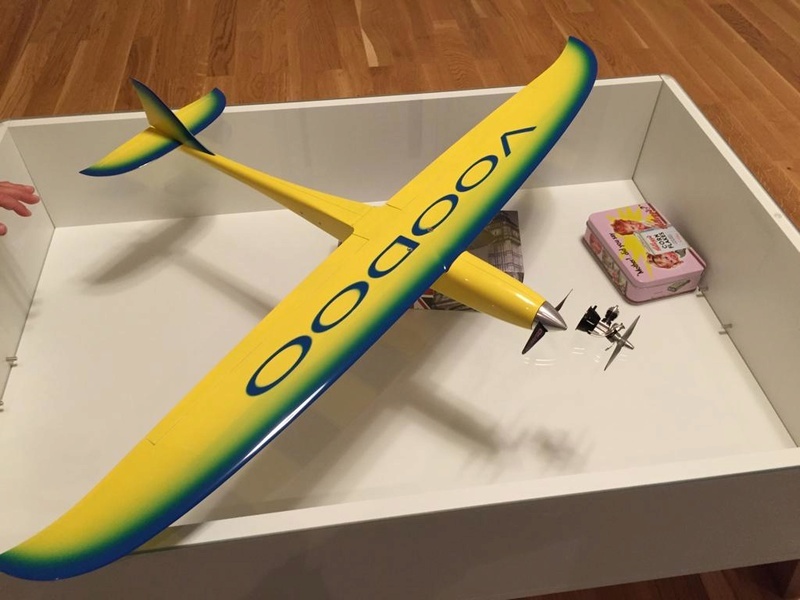 On some of the RTF balsa models I built such offsetting was simply missing form the design, and the plane flew straight without any trimming required. Job done. 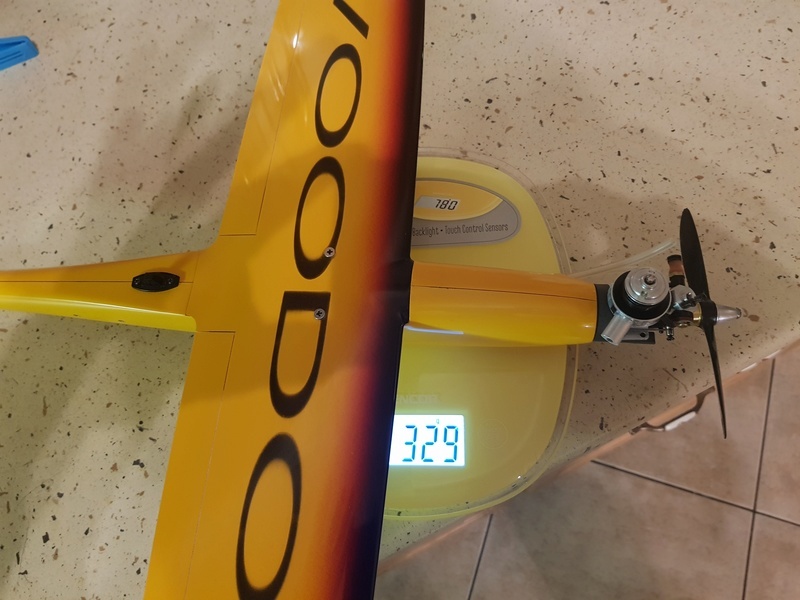 The TeeDeeVoodoo weighs 329 grams dry i.e. a tad less than 11 oz. 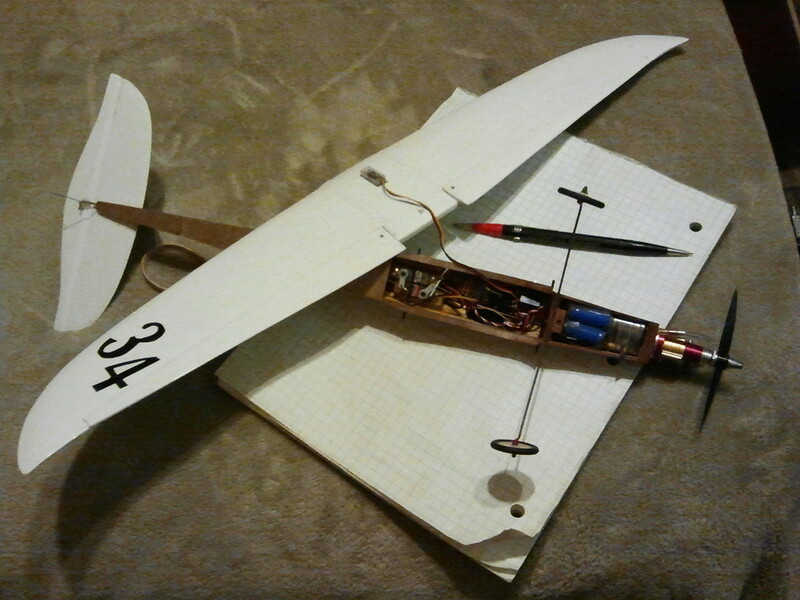 I managed to cram everything in the belly with the switch mounted on the fuselage back, and wait for Spring to come. 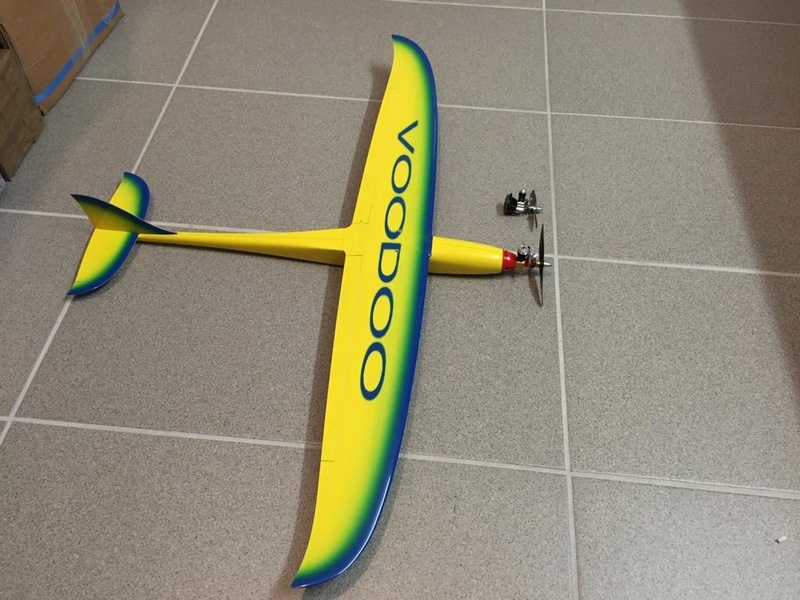 I proudly sent some pics to the German retailer to show the versatility of the VooDoo and their brief answer was they do not like glow engines...I thought they could use some promo material to pull in more customers not only from the world of electric flyers but anyway they know it better..
Woida do you have any video? balogh wrote: Job done. The TeeDeeVoodoo weighs 329 grams dry i.e. a tad less than 11 oz. 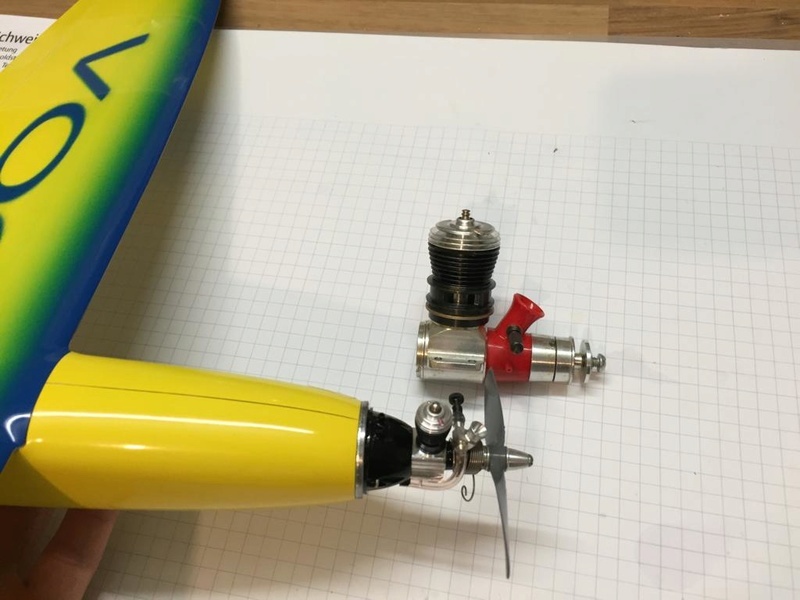 In one of your posts you said a HQ 5030 quadcopter prop may be an upgrade compared to the COX 5x3 and similar props when used on a TD049 or similar. HQ 5045 carbon blend speed tip prop. 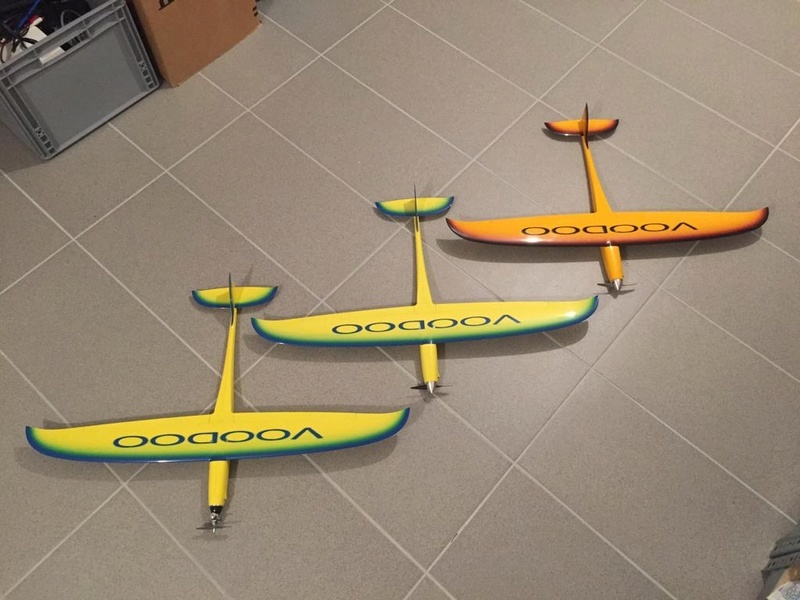 I can get hold of these quadcoptrer props in my neighborhood (some hobbyshops that survived sell them) but was just not sure if they are really THAT better than normal, IC engine props of comparable size? TD RC .051 with stock muffler with a pressure tap. NV set a tad rich with this being the second flight of the engine. 9oz RTF / 1oz fuel tank 6.04 minutes of total engine run time. 25% nitro / 20% oil 4x5 prop will make for best speed.